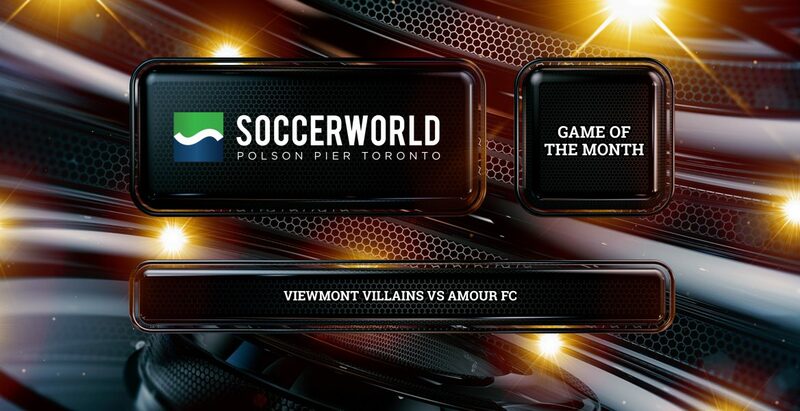 TORONTO – In an important early season game the Viewmont Villains bested Amour FC 4-1 to catapult them into a tie atop the standings. From the outset the Villains gained control of the game; they dominated possession and created the majority of scoring chances. It didn’t take long for the Villains to break open the scoring, striking first in the sixth minute of the game off the foot of Dominic Brown. Brown got a clean shot away from in close after Romel Drar had received the ball at half and broke in on the Amour FC defence on a two-on-two. Drar dribbled around the first defender and fed a wide-open Brown to the left of Amour FC goaltender Kishan Lakhani, who one-timed the shot past the goalie for the opening goal of the game. The Villains responded with a second goal right afterwards from Jared Nylander to double their lead. Once again Drar found himself alone coming down the wing and drew the defender to him. Drar then caught the Armour FC defender flat footed to find an unmarked Nylander wide open in front of an open net to easily deposit one for the two-goal lead. Things weren’t much better in the second half for Amour FC. Brown netted his second of the night, and Drar potted another to double their lead to four with just over 10 minutes left in the game. Amour FC had a meaningless strike to close the gap to three but would never overcome the deficit. Brown said after the game that the key for the Villains victory and offensive prowess was simply moving the ball. Drar, who had a goal and two assists on the night, made a habit of drawing the defender towards him to find the open man for a couple of wide open shots that led to goals. With the win Viewmont moved to the top of the table in a three-way tie with Amour FC and The Dirty.